Missed dinner while playing the slot machines at Choctaw last night. Was going to get a Burger and Fries at the short order grill but the line seemed to be moving slooowww. Noticed the deli had only one person in line, so went with cold cuts instead of fried food. 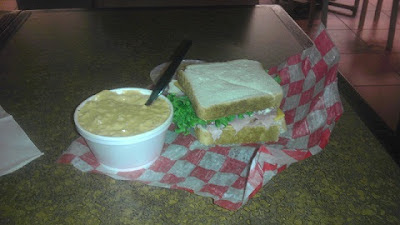 Order Ham on White Bread with Lettuce, Tomato, Onions, Cheddar Cheese, and Mayo. Entree comes with a choice of Chips or Soup. Went with the Zesty Cheese Soup. Good meal that definitely satisfied the hunger craving!